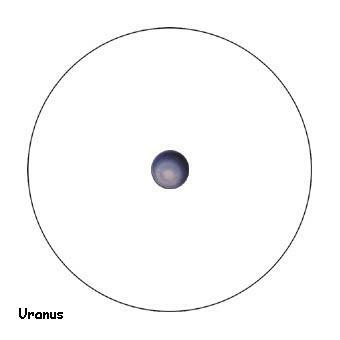 Our solar system is huge by our human standards and miniscule in terms of our galaxy and beyond. This site is a virtual planet stroll designed for the downtown section of the City of Madison in south central Wisconsin. 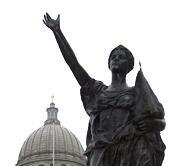 Madison is the capitol city of Wisconsin and also home to the main campus of The University of Wisconsin system. The administration building of the university (Bascom Hall) sits atop Bascom Hill where one has a fairly uninterrupted view of downtown Madison to the east all the way to the State Capitol Building. A nearly straight 1.5-km path connects these two prominent buildings, and mainly falls along State Street; one of our City's focal regions for dining, entertainment, and shopping. This pedestrian path is perfectly suited for the construction of a 4,000,000,000 to 1 scale model of our solar system with the Sun sitting on top of Bascom Hill and Pluto resting at the steps of the State Capitol. This site is available so that anyone can take the stroll using their computer and still obtain a fairly true feeling for the enormous distances that are covered between the planets compared to their relatively minute proportional sizes. The entire tour is shown on the map below. North is up. 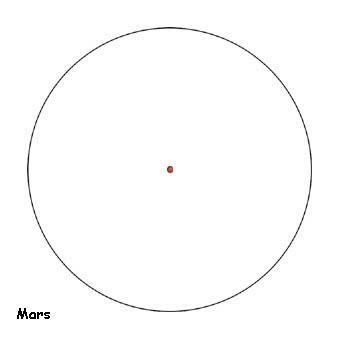 The Sun is marked with a yellow dot, while all planets are marked with red dots. Note - These dots merely mark location. They are NOT representative of size for the stroll. Bascom Hall is on the extreme left, while the State Capitol is on the extreme right. The distance from Bascom Hall to the State Capitol Building is approximately 1.5 km. 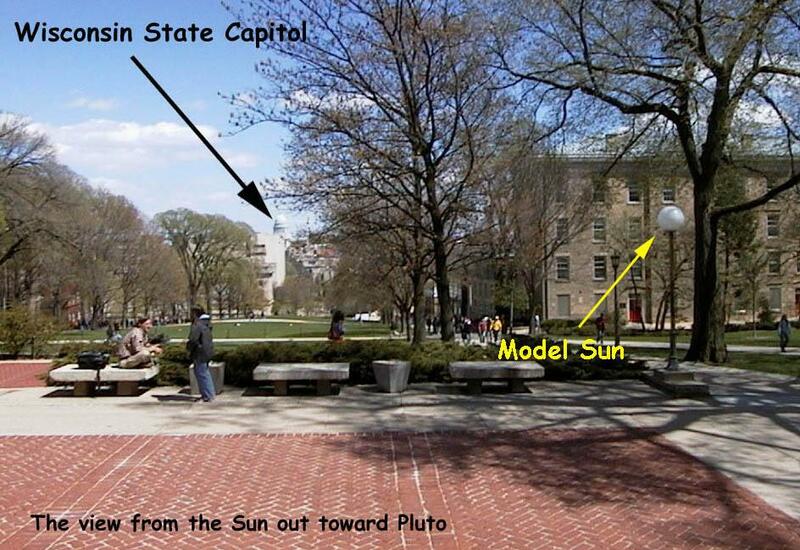 An enlargement of the inner planet region on Bascom Hill is shown below. First, take a look at the Model Sun used on the tour. This orb-shaped lamp representing our Sun is almost perfectly scaled for the tour (350 mm in diameter). And it lights up too!.....isn't that spiffy? 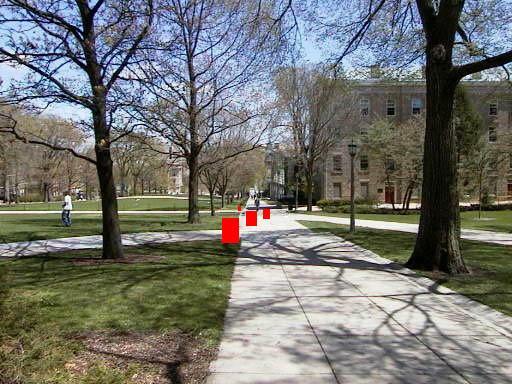 A sad announcement: As of about mid-year 2007, the University grounds crew upgraded (IMHO – downgraded) the lamps at the top of Bascom Hill. As a result, the Model Sun seen in the hyper-linked picture above has been replaced by an ugly gothic-looking thing. Those BUMS! Oh well…if you happen to visit the actual site, make sure you have a picture of the Model Sun shown above and a ruler that goes up to at least 35cm (or bring a yellow ball of about 35cm diameter). From that point, you will just have to imagine. 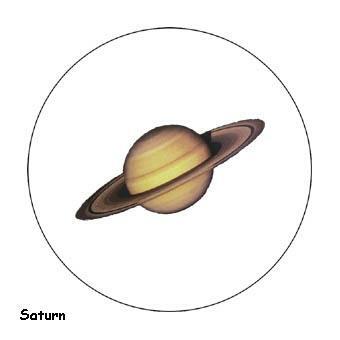 Next, scroll down and click on the individual planet images below in order to pull up images of the planets, scaled correctly for this Planet Stroll and centered within 10-cm black rings. If you save these planet images to your computer and then print them, they should print at the actual size used for the Stroll. With respect to the scaled images provided for this tour, here is a demonstration that illustrates how accurate the scaling is for the tour. Do not try to print them directly from the browser window (i.e. - trying to print the images without saving them to your drive). They will not print at the correct size if you do this. As an alternative to printing individual images, I am also offering you a pdf file (planets.pdf) that has all the planets on one page and scaled correctly for the tour. You will need a copy of Adobe acrobat reader to view and print this file. No matter which method you choose above to access the scaled planet images, I strongly recommend that you print them on ink jet quality paper or better. Some of the scaled planets are pretty tiny, and so better paper will provide better images of the smaller objects. 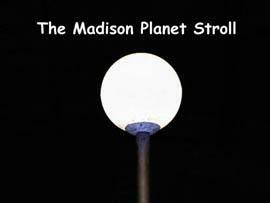 Finally, view the Madison Planet Stroll Movie**, which is designed to give you a feel for the distance covered on the stroll. 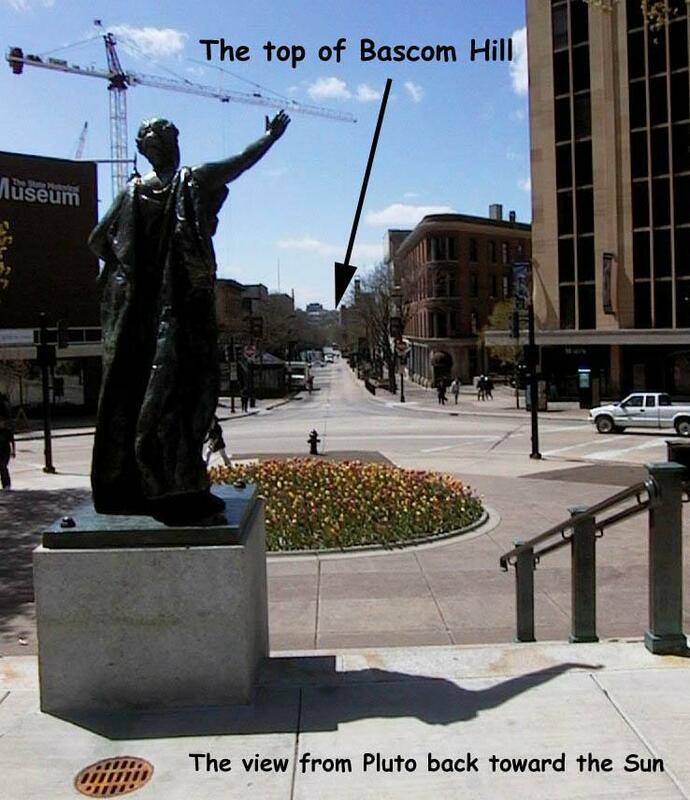 The movie traces the tour from its beginning next to the Model Sun on top of Bascom Hill to its end on the steps of the State Capitol 1.5 km away. Approximately 10 meters separates each frame in the movie. Within the movie, I have marked the appropriate movie frames with bright red slabs to indicate the location of the planets along the stroll from beginning to end (letter designations will appear on the slabs to indicate planet identity). 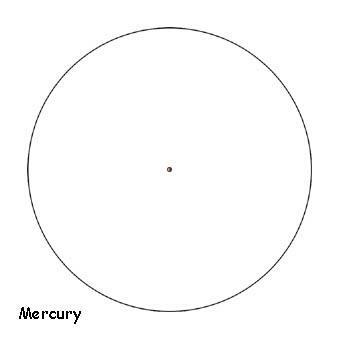 In the initial frames, you will be able to see markers for the inner planets (Mercury through Mars, inclusive) within the confines of a single photographic field of view. 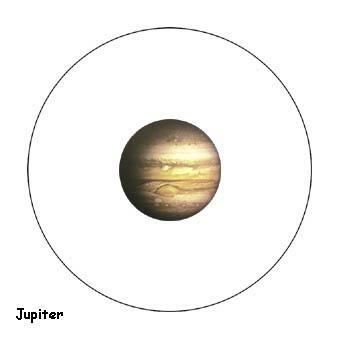 Please try to keep in mind how small the scaled planets are along this tour (Jupiter, the largest planet in our Solar System, will be a bit smaller than a golf ball on the planet stroll). The stroll concludes with Pluto, which will be located as a tiny speck in the palm of Miss Forward's outstretched hand (a Wisconsin state emblem and statue situated on the west steps of the Capitol). And in terms of speed, you will zoom from Bascom Hill to the Capitol steps (about 1 mile) in two minutes. On the scale of our actual Solar System, this would translate to a rate greater than 100 times the speed of light. A fun option - Once you have viewed the entire movie in its normal time (1 frame per second), use your mouse to manually drag the scrolling play tab back and forth at any rate you wish to speed forward or backward through the movie. In some ways, this can give a better feel for the great distance you have traveled from beginning to end. **IMPORTANT - You will need QuickTime to view the available movie files. Please take the time to follow the link to the download site and obtain this program for your computer. The installation is free and easy, so you can't miss. The files are formatted in a manner that allows them to be viewed on either Mac or PC platforms. The view to "Pluto" from "The Sun"
The view to "The Sun" from "Pluto"
Does scaling the Solar System down, as we have done here, present us with an incorrect view of the way the real Solar System actually is? Not at all! Click here and see. 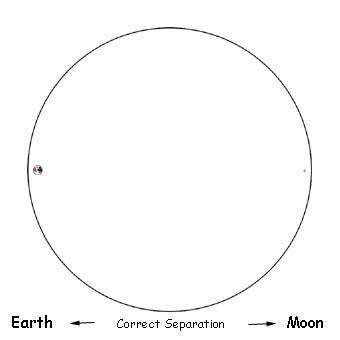 There sure is a lot of empty space between the Sun and the Planets, isn't there? Just how empty is this space? Go here to get an idea. You also may be asking where the next closest star (after our Sun) would be located on this model. That star is Proxima Centauri. It is the closest member of the Alpha Centauri multistar group and is located about 4.24 light-years away from our solar system. Therefore, on the scale of our present model, Proxima Centauri would be "sunning" itself on the beaches of Fiji, about 10,000 km away. THIS star is our nearest neighbor! Views of the Solar System & The Nine Planets - Two wonderful pages containing tons of facts about our Solar System. The National Space Science Data Center - A NASA website with links to many of their public archives. Solar System Scale Models - I'm clearly not the only one interested in model making. The Apollo Lunar Surface Journals - Even though the Earth and Moon are only 10 cm apart on this planet stroll, landing humans on the lunar surface still ranks as one of the crowning achievements of human endeavor. NASA Histories On-Line - Landing on the Moon was a big event, but it certainly wasn't the only feather in NASA's cap. Astronomy Glossary - A word has you confused? Maybe you can find it here. I certainly hope this stroll has presented you with an awe inspiring feel for our Cosmic island. Please share this URL with your friends and colleagues. It represents an educational tool designed for the purpose of reaching as many people as possible. 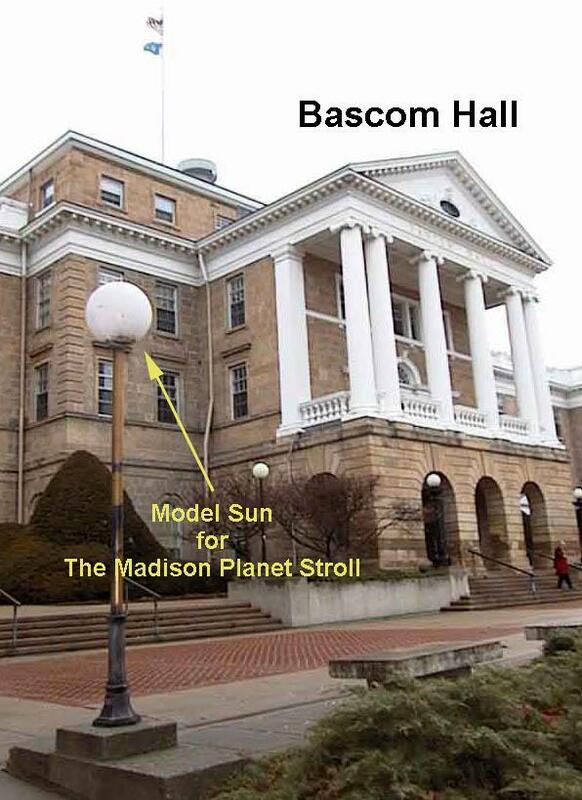 If you live close to Madison, I hope you will take the opportunity to venture the actual stroll (don't forget to bring along printed copies of the scaled planets that I have provided to you above). In the future, it would be wonderful if scaled planet models could be installed permanently along the route. But for the moment, this is just a dream. If you are a local educator, this stroll could provide you with a unique multidisciplined field trip for your students, since one can explore the University, and the State Capitol in addition to learning about the Cosmos. If you would like to make comments or suggestions about this site, please send me a note! Good Bye and Thanks for visiting! And don't forget... KEEP LOOKING UP! My domain name, pbdot3, stands for pale blue dot 3, borrowed from Carl Sagan and The Third Rock from the Sun. This URL has been available to the public since May 2002.